This island is a famous paradise located in Kalimantan, with the beautiful scene and coral reefs that can be seen clearly from the surface of the water. Access to Derawan Island can be reached by plane to Balikpapan. Then, the trip can continue through Berau or Tarakan. From Berau, you can go to Tanjung Batu by car or taxi. After that, from Tanjung Batu there is a small speedboat with a distance to the island of Derawan about 45 minutes and costs Rp 50.000,00. The island is well-known because of its sea turtle and the white sands, with an area of about 15 hectares. If you go diving here, you’ll meet the famous giant manta rays whose width can reach 5,5m. Besides turtles and manta rays that are the main attraction, you can also find angelfish, goatfish, octopus, nudibranch, giant clam, clownfish, and ribbon eels. The excellence of this place is it has a prehistoric saltwater lake with lots of stingless jellyfish. There are four types of stingless jellyfish here: aurelia aurita with transparent plate shape, cystophora with the smallest size, mestigeas papua which is the most frequent visible, and casiopeia ornata with reserve position. In addition, there are barracudas, white tip, black tip, and hammerhead sharks too. With 262 species of coral reefs, 596 species of fish, and dozens of other marine animals, Pulau Togean is the right place for passionate divers. The easiest route to get to Pulau Togean is through Gorontalo by plane. From Jalaluddin Gorontalo airport, you can reach Togean with Bumbulan Paguat for around 3 hours. Then, you can use Cengkeh Afo ship which only spend 6 hours trip. This ship only departure every Monday and Thursday at 08.00 WITA. The fact that this island is remote and far from urban, makes it a virgin island with very clear water and exotic biota. The coral reefs and fish can easily be seen by just walking 5 meters from the edge of beach. Uniquely, there is a dive spot in Pulau Kadidiri that contains the debris of the B24 aircraft remaining from World War II. You can drive by speedboat as far as 16 km to the northeast of Pulau Kadidiri to reach the spot. With the meaning of the name is a large stone, it is the largest and most accessible island in Togean. The marine life can be seen effortlessly because the water is very transparent with a sparkling white sand along the beach. Pulau Batudaka is also famous with its mangrove forest that is attractive. Located in Lombok, Pulau Gili is a paradise for local and foreign divers because of the beautiful panorama and underwater biota. It consists of 3 small islands which are Gili Air, Gili Meno, and Gili Trawangan, but the famous islands for diving are only Gili Trawangan and Gili Meno. To reach the island, you can use a fast boat from Padangbai Port in Bali with 1,5 hours trip and costs above Rp 500.000,00. For more affordable trip, you can go through Pulau Lombok by plane and go to Teluk Nara by ship. Then, from Teluk Nara there is a speedboat directly to Pulau Gili. 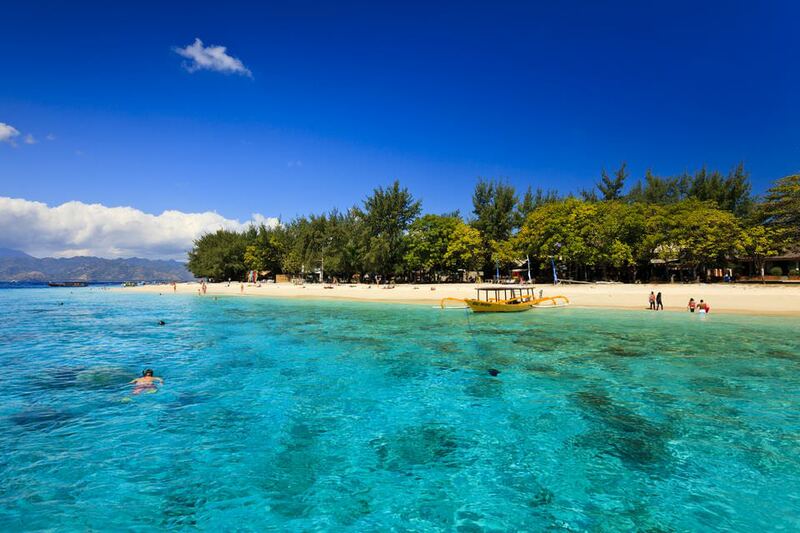 It is the largest and most popular island in Pulau Gili, crowded with tourists especially from abroad. When you’re here to dive, shark point is a must with various types of sharks such as White and Black Tip Reef Sharks. Green Sea Turtles, Anemone Fish, Ribbon Eels, Octopus, and Scorpionfish are easy to find too there. As the smallest and most peaceful island among the others, Gili Meno is suitable for divers who are looking for a quiet atmosphere. We recommend you Gili Meno Wall as a diving spot, which offers an interesting sightseeing of sea turtle. A mix of coral rubble and branching corals at around 5 meters are worth to see in Gili Meno Wall. There are still plenty other spots, but here are some of the best sites for having an unforgettable diving experience. With these paradise dive spots, you can start considering Central Indonesia as your next stop for diving. Besides diving, Central Indonesia has a lot of nature activities and its own beautiful flora and fauna. Let’s be proud of our beautiful country and preserve it!